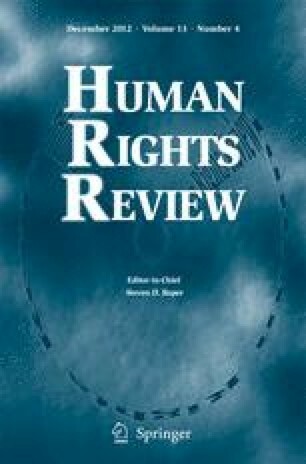 This paper examines the effects of non-derogability status for seven human rights during declared states of emergency from 1996 to 2004 in 195 countries. For this purpose, we create several original measures of countries’ state of emergency status. Our analysis finds the intended protections from the special legal status of non-derogable rights to be anemic, at best, during declared emergencies. This finding begs a reconsideration of both the utility of the “non-derogable” categorization in both international and municipal law, and the conditions under which declared states of emergency might be justified. The authors thank Richard Wilson and David Cingranelli for their counsel. This research has benefitted from support by the National Science Foundation (NSF) via Grant Nos. SES- 0318273, SES- 0647969, and SES- 0647916. The NSF is not responsible for any opinions, findings, or conclusions related to this work. Cingranelli, David L. and David L. Richards. 2008. The Cingranelli-Richards (CIRI) Human Rights Data Project Coding Manual. Version 2008.7.30. <http://ciri.binghamton.edu/documentation/ciri_coding_guide.pdf>. Accessed Octorber 12, 2012. Cingranelli, David L., and David L. Richards. 2010. The Cingranelli-Richards (CIRI) Human Rights Dataset. Version 2010.8.15. <http://www.humanrightsdata.org>. Accessed Octorber 12, 2012. CNN Wire Staff. 2012. “Egypt lifts unpopular emergency law.” June 2. http://www.cnn.com/2012/05/31/world/africa/egypt-emergency-law/index.html. Accessed October 12, 2012. Erakat, Noura. 2011. “Emergency Laws, the Arab Spring, and the Struggle Against ‘Human Rights’.” Jadaliyya <http://www.jadaliyya.com/pages/index/2051/emergency-laws-the-arab-spring-and-the-struggle-ag> Last Accessed October 12, 2012. Heston, Alan, Robert Summers, and Bettina Aten. 2006. Penn World Table Version 6.2. Center for International Comparisons of Production: Income and Prices at the University of Pennsylvania. http://pwt.econ.upenn.edu/php_site/pwt_index.php> Last Accessed October 12, 2012. Livingstone, Stephen. 2002. “International Law relating to States of Emergency and Derogations from International Human Rights Law Treaties.” Paper presented at the Nepal National Workshop for Lawyers on the Legal Protection of Human Rights II: Litigating Human Rights during a State of Emergency, Dhulikhel, Nepal, September 27 – 29. http://www.interights.org/doc/Livingstone_derogation_final.doc> Last Accessed October 12, 2012. Macken, Claire. 2005. “Terrorism as a State of Emergency in International Law.” Paper presented at the ANZSIL 2005 Conference, Canberra, Australia, June 16-18. <http://law.anu.edu.au/cipl/Conferences&SawerLecture/05%20ANZSIL%20Papers/Macken.pdf> Last Accessed October 12, 2012. Marshall, Monty G., and Keith Jaggers. 2005. “Polity IV Project: Dataset Users’ Manual.” <http://www.cidcm.umd.edu/polity/datap4manualv2004.pdf/>. Last accessed May 27, 2007. Monty G. Marshall and Keith Jaggers. 2006. Polity Data Set. Version p4v2006. College Park, MD: Center for International Development and Conflict Management, University of Maryland. < http://www.cidcm.umd.edu/polity/>. Last accessed May 27, 2007. Strand, Håvard, Joachim Carlsen, Nils Petter Gleditsch, Håvard Hegre, Christin Ormhaug & Lars Wilhelmsen. 2005. “Armed Conflict Dataset Codebook, Version 3-2005.” <http://new.prio.no/upload/datasets/ac3-2006b/Codebook_v3-2005.pdf>. Last accessed May 27, 2007. United States Department of State. Annual. Country Reports on Human Rights Practices.< http://www.state.gov/g/drl/rls/hrrpt/> and <http://www.state.gov/www/global/human_rights/hrp_reports_mainhp.html>. Accessed Octorber 12, 2012.